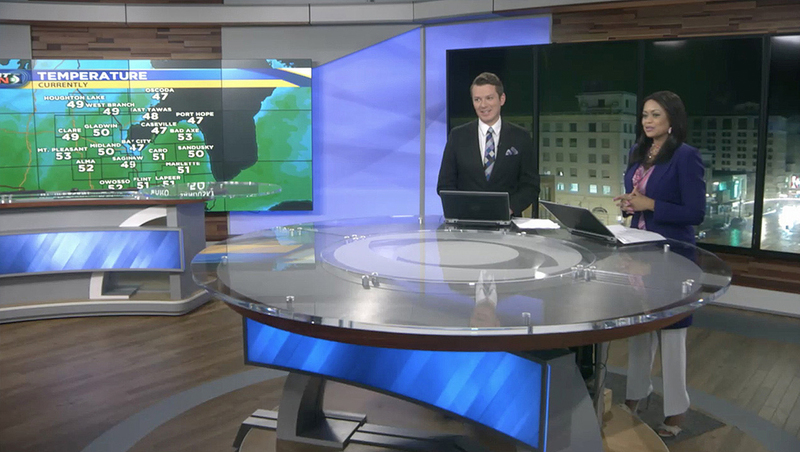 WNEM, Meredith’s CBS affiliate in Saginaw, Flint and Bay City, Michigan, has overhauled its set, graphics and music. The new set, from Devlin Design Group, features a circular standing anchor pod with the CBS eye emblazoned on it and backed with a five panel vertical monitor array mounted on a dark wood wall. The rest of the set’s walls features backlit printed graphics that features gentle curves, which are echoed in the gray arches that flow down from the studio’s header. Camera right is a standup area a horizontal video panel, while an additional three-panel vertical array provides an additional standup area. The set’s technology was provided and integrated by Digital Video Group. 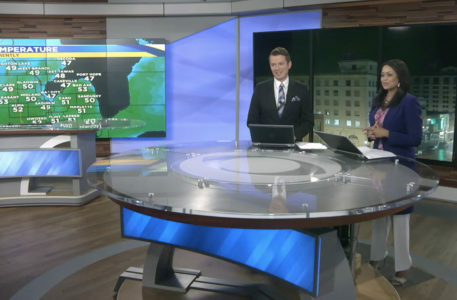 On the left side of the studio is the station’s weather center, which is equipped with a video wall mounted in front of the backlit wall as well as a wide work surface fronted with an angled printed graphic, which matches the one found on the anchor desk. 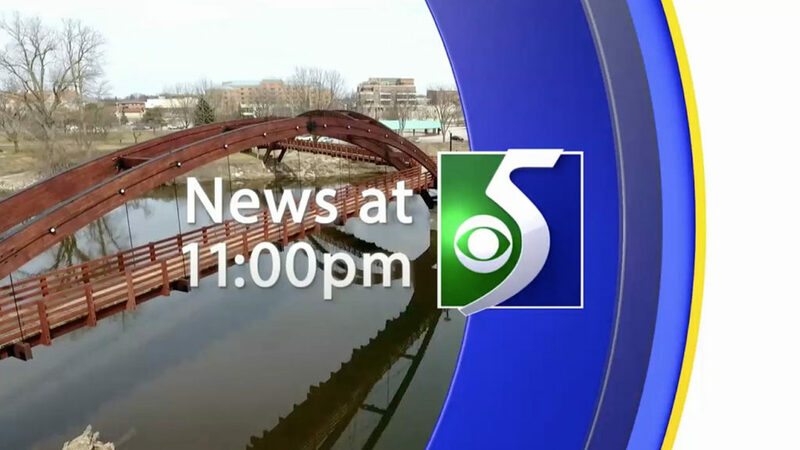 The station has, however, retained its familiar “5” logo, which is meant to convey a winding river, which adds a splash of green to the otherwise blue and yellow palette. The station also updated to the CBS O&O graphics package from Linear Drift, whose curved elements tie into the set design. One notable change, however, is that WNEM did not use the normal font the CBS O&O package uses — Gotham — instead opting for Calibri, which has gain popularity thanks to its role as one of the default fonts in Microsoft Office. In addition to the set and graphics updates, the station has switched to Warner/Chappell Production Music’s Enforcer news music package, which is used by CBS O&Os. The station also used the package in the past.